NOTE: The Ten Tips Series is an ongoing project which builds upon past installments. 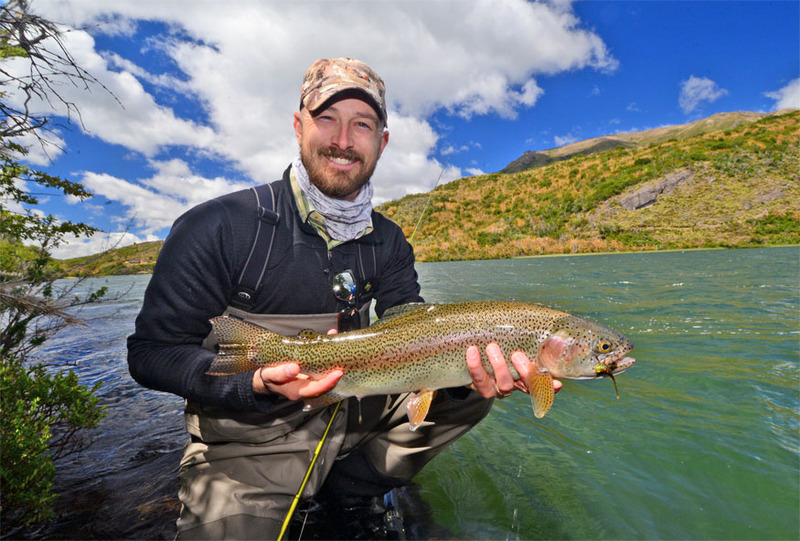 This explanation is intended for anglers who are already familiar with the basics of fly fishing, and advanced terminology may not be explained here. For more details, check past articles and postings on this site, or post specific questions to the Board. We are always more than happy to help you understand. MODERN FLY ANGLING has taken a turn for the robust. 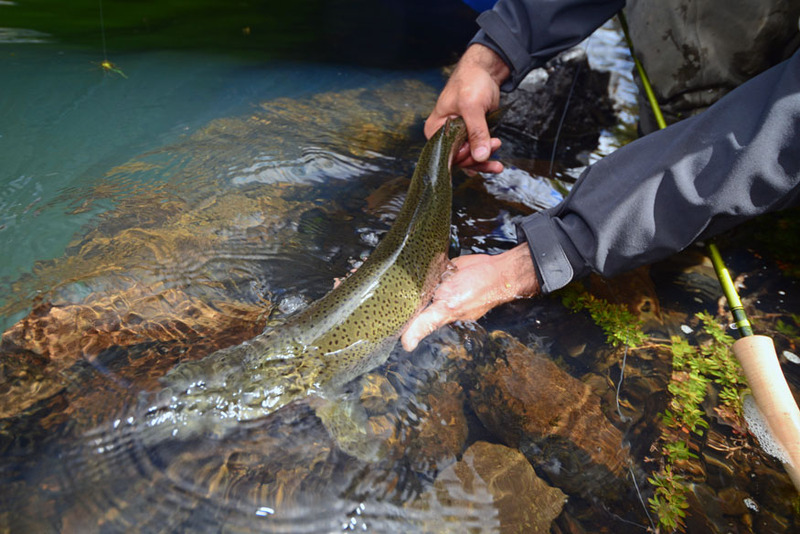 Thanks to innovators like Blane Chocklett and Kelly Galloup, along with a slew of excellent anglers in places as far-flung as Arkansas, Michigan, Montana and Patagonia, the definition of “streamer” fishing has fundamentally changed within the last fifteen years. In the old days, a fly angler who said he was fishing streamers most likely meant wooly buggers or a variant thereof. These smallish, single-hooked flies rarely exceeded three inches in length and could imitate both fish and (when dead-drifted) even large aquatic bugs like stonefly nymphs. Most of the larger, fish-imitating streamers were reserved for saltwater fishing or warmwater fishing (commonly referred to as “bass bugs” whether or not they looked anything like an actual bug). Galloup and company changed all that. They added mass, multiple hooks, and stole willy-nilly from salt- and warm-water applications in designing their new flies. The results speak for themselves. In Steve Dally’s Ozark Fly Fisher shop in Gassville, Arkansas, the walls are lined with jumbo pictures of jumbo fish — you have to break twenty-eight inches to earn a place of honor, and the shop has nevertheless been wallpapered in less than five years. With very few exceptions, the bank-bashing game is a sinking line fishery. The issue is with where fish sit in the water column. Unless there’s a Hexagenia hatch and you’re in Michigan, or there’s a stream of hoppers tumbling off the banks, big fish tend not to show themselves. Instead they lurk in the depths, occupying prime feeding lies that in some cases they worked years to earn. These positions are often underneath or adjacent to sub-surface cut banks, which should be familiar to you if you’ve ever tossed hoppers at a mud wall. These sames shelves and drop-offs exist underwater, too, and the fish will sit in relatively the same locations next to them. The only difference is, the starting point is not the surface, but the shelf of the bank, which may already be three feet down. Accordingly, these fish could be six to eight feet below the surface even if they are close to the bank. That’s too far for even the heaviest weighted streamer to reach if you’re fishing a floating line. In other words, the default should be a sinking line, and you can save the floater for special situations. Sinking lines come in both sink-tip (where the shooting line floats) and full-sink varieties. Sink-tips are more beginner-friendly since they tend not to plummet as deep and thus get hung up less. The floating running line serves as a “balloon” of sorts, and every time you strip the line, the fly will jump up slightly. Unfortunately, the old axiom ‘if you ain’t getting hung up, you ain’t fishing deep enough’ comes into play here. The key with a full-sinking line is to keep the fly moving so it never has time to settle to the bottom and get snagged. This is probably the biggest mistake I see bank-bashing anglers make; even experienced ones. They will put the fly three to six feet away from the structure or bank wall then immediately begin stripping it back. This isn’t going to work. Streamers–even big heavy ones–need time to sink. Remember that the browns are sitting adjacent to underwater shelf structure more times than not. They are waiting for something to slide over that shelf so they can ambush it. The shelves themselves start three to six feet or more off the bank, and if you put your fly directly on top of them, it will still be six to eight feet above that lurking brown trout. Instead, you have to put your fly as close to the structure as humanly possible. That will give it time and distance to sink into the brown trout’s strike zone before you strip it off the shelf just over his head. This takes focus and repeated good casts. Don’t allow yourself to fall into the bad habit of just going through the motions with casts in the general area of structure. If you aren’t right on top of it (and I mean six inches here), then you might as well be casting out into the middle of the river. Bank-bashing is a lot like mowing the lawn. If you want to do a good job, you need to cover the water thoroughly and not leave big stripes of unfinished space in between your passes. Too many bank anglers spend their time selecting likely lies and leave yards of water in between. Yes, this may produce some fish, but remember, you generally can’t see what the structure looks like eight feet down. Skipping a blank section of wall because you don’t see a downed tree sticking out of the water is like looking down from an airplane and assuming no one below you drives cars, just because you can’t see any. Maximize your chances of success by remaining focused and keeping the fly wet. 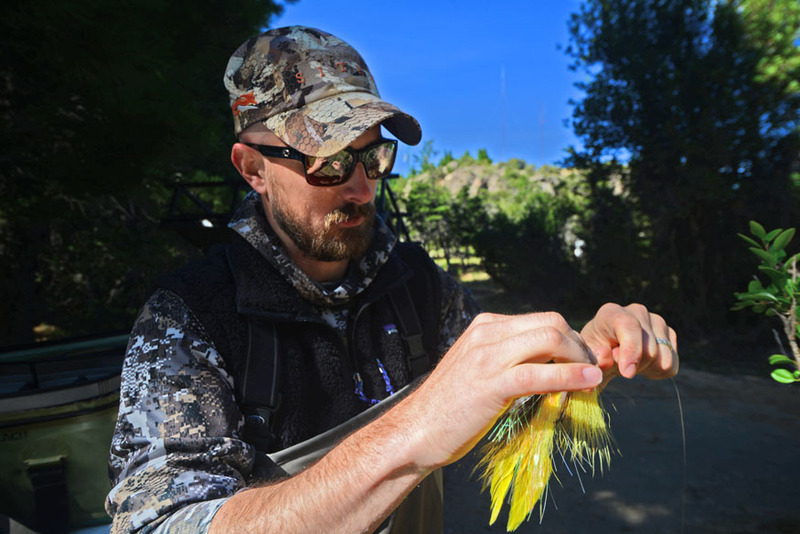 Big flies require special care and some degree of advanced skill–but don’t be intimidated. A quiet, well-handled boat can produce fish even if you’re only forty feet off the bank. You aren’t going to be in a quiet, well-handled boat though, if your boat handler is having to watch out for flying land mines all the time. Anglers in the front of the boat should keep their casts in front of the boat. This means you. No casting over the cockpit whatsoever no matter what. If you’re fishing river right and you’re right handed, you have to use a backhanded cast so you can keep the loop and the fly out in front. Conversely, if you’re fishing river left and you’re a right handed angler fishing from the rear seat, now it’s your turn to make a backhanded cast. Big flies can occasionally require water hauling, but that should not be your norm. Keep your casts in the air and learn to effectively use your double haul and your shooting head system to launch flies safely. Articulated and larger streamers have a habit of getting fouled. Another common mistake I see a lot is the angler who flubs a cast, but picks the fly up and keeps on fishing anyway. This is a recipe for disaster. Crashed casts almost always result from tailing loops and more often than not create wind knots in the system. Wind knots greatly decrease the tensile strength of the system and will totally, absolutely, cost you that big fish when you finally do hook up. Nothing stings like popping off a two foot long brown because you got lazy a half hour before and failed to pick out a wind knot. If you flub a cast, check your fly. From time to time, check your ferrules to make sure they aren’t loose. Check around you; are you leaving line on the deck and twisting it with each cast? Be alert. This is a process with many moving parts. Line management is critical in a drift boat. This is just a fact of life. In the front cockpit, throwing large flies on heavy rods gives you two options: you can use the front “scoop” or basket for its intended line-holding purpose, although these are often too small and crowded to properly contain a full 100′ sinking line, or you can use the floor. Be very aware, however, that drift boat floors contain very heavy traction grit; far rougher than even regular concrete. If you pile your line in the floor and then step on it or put a bag down on it and start trying to rip line in a haul, you are going to shred your expensive fly line. This especially goes for borrowed tackle–no guide (or fishing buddy) wants his line returned in shreds. The best practice for line management is to only strip off the amount you will cast every time, so that a cast sails “all the way to the reel.” This will prevent the shooting line from getting twisted as it lays at your feet. You also should keep your shooting line area wet; a hand towel is great for this, and the towel also makes a convenient pad to lay under the line. Finally, when retrieving line, stack it with the back or reel-side of the line at the bottom of the pile. With each subsequent strip, lay the line down in a loose, open loop so that the line closest to your fly always stays on top. This will massively improve your shootability and will cut down on knots in your running line. Knots form when the line crosses over itself. Remember that. The shape of your loop can tell you everything about how you are casting. Open, with the fly falling in piles? You need to tighten up your power stroke and apply more power to a harder stop. Crossing over itself and getting tangled? You have a tailing loop, and you need to be evaluated for either punch or creep. Flopping off to the side at the last minute as the fly turns over? Your casts are out of plane with each other. Out of plane casts are very common in a drift boat, especially when you’re throwing long distances and moving laterally at a decent speed. This is simple: you are moving. When you begin your backcast you are in position A, and by the time you start into your forward stroke you may be in position B, ten feet further down river. The effect is most pronounced in bank-bashing because you are almost always casting laterally to the wall, rather than across-and-down as you more typically would in a drift boat. Keep an eye on how your fly turns over and if you see it flopping sideways, make the correction by anticipating your forward movement as you set up the backcast. 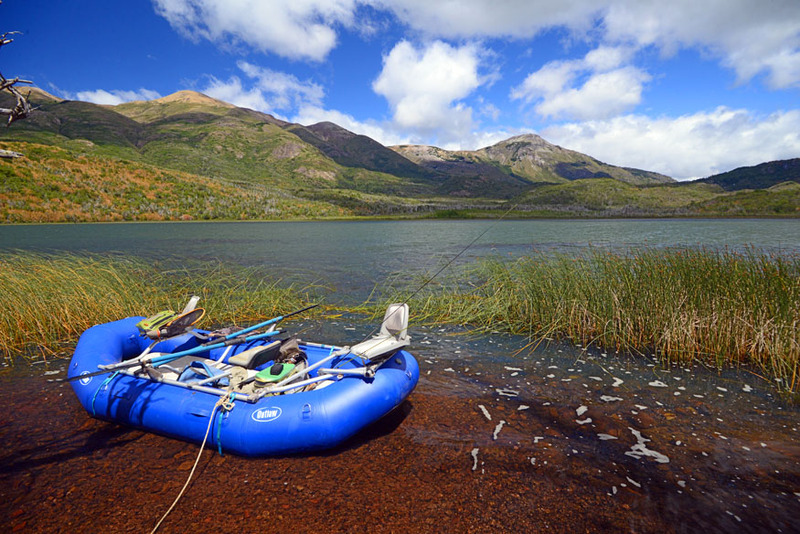 Fighting a big trout in a drift boat–especially in heavy water moving quickly–is a three ring circus. Your man on the sticks is typically going to try to get you into the middle of the river, away from the bank. Your fishing buddy, if he has half a brain cell, is going to quickly reel in his own line (cursed be he that keeps fishing through his buddy’s epic fight) and is going to be moving for the boat net. You, as the angler, really need to be focused on shortening the fight as much as possible. The best way to whip a big fish in a hurry is to fight him low, like a tarpon angler. Raise the rod no further than 45 degrees from the horizontal (and this goes for any direction you may choose to hold the rod — it is possible to high stick sideways). As soon as you have the rod to 45 degrees, pump down while recovering line. Don’t try to hand-line a plus-sized brown trout, even if you could. Put him on the reel to keep your working area clear. Once you have begun pumping the fish, change directions on him. Nothing wears a brown trout out faster than changing his angle of momentum and forcing him back against himself. Do not attempt to lift the fish’s head to the surface until he is legitimately tired, and always always always plan on the net run. It will happen. Show him the net just to get it over with and don’t even try to net him on the first pass. The hardest thing about bank-bashing is probably the sighted fish. 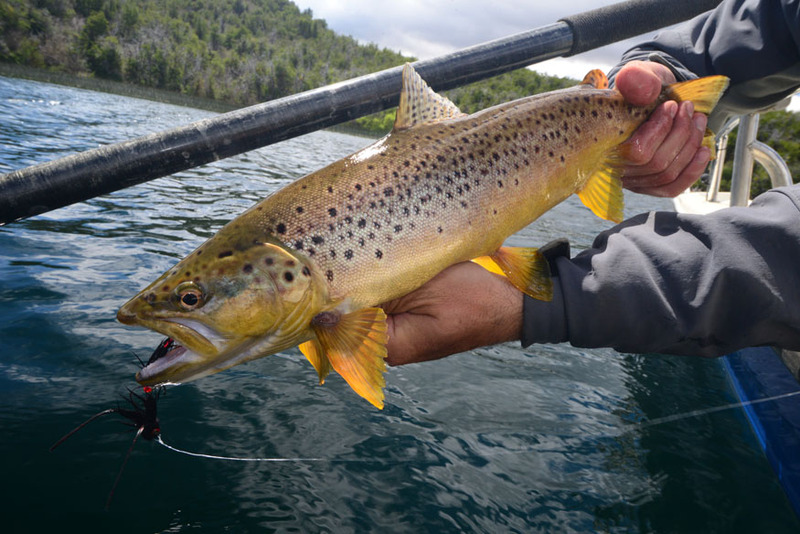 I had one glorious nightmare of a day on a high alpine lake in Argentina, when I pulled twenty-seven brown trout over twenty four inches off the wall fishing huge articulated flies they had never seen before. We converted only two fish, for two reasons: first, my flies were tied on extremely large striper hooks, with overly heavy hook gauges, and second, I failed to set the hook hard enough to overcome rock-hard piscivorous brown trout mouths at range. When you’re yanking on a fish that’s seventy plus feet away, a certain amount of line stretch is inevitable. This is not a time for half-measures. Pull the line taut to the fish, then strip-strike. Once you’ve strip-struck the first time, do it again one more time. You aren’t going to break off even a massive brown on fifteen pound tippet (seriously, try breaking fifteen pound mono against a table leg some time with your hand, then do it again with a rod — you probably can’t). But if you don’t get the hook buried, that fish can and will shake off. Trolling motors are the bane of the sinking line’s existence. 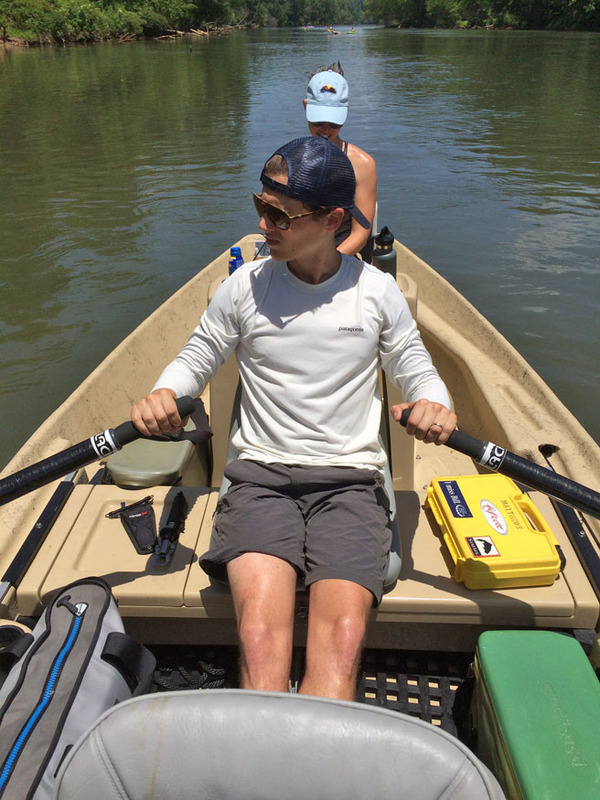 Depending on the fishery, whether a flatwater lake or an extremely slow-moving river, you may indeed find yourself under electric power. I stay away from trolling motors with sinking fly line at all costs. They will flat eat a line, and it is almost inevitably going to happen if you fish next to one all day. If possible, just say no. Good luck out there, and if you have questions, as always, feel free to post them to the Board. 2 Responses to "Ten Tips to Improve Your Bank-Bashing Results"
Loving this series. We jumped in on this article and can’t wait to dive through the other past posts. Awesome break down of tips, and information. Looking forward to trying our hand at some of this the next time we’re out. Great share. Great tips accordingly. Its a great help for those who are just started fishing and to those who are having a hard time for a bite.